ICE has been building relationships with employers for many years. We believe that working together is important because it helps the industry to progress. But we can also help organisations in other ways too. 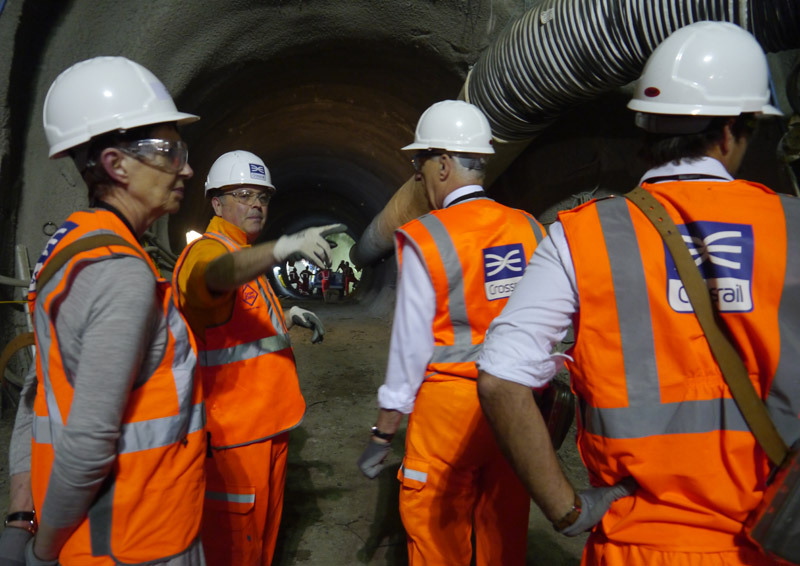 Crossrail staff lead a tour of tunnels under construction. Crossrail is just one of a number of employers benefitting from ICE members' knowledge and competence. Picture courtesy of Crossrail. We support your staff to become professionally qualified, publicise your successes, and even make it easier for you to get more involved in the local community. Our professional qualifications are recognised around the world. They show that our members – your employees – have the right skills and knowledge. They also help other people to see your commitment to learning, development and high standards. To become chartered engineers, incorporated engineers or engineering technicians, our members follow an industry-leading programme of professional development. This development shows off the abilities of your workforce. See our guidance on the ICE Training Scheme for more information on how to set up and run the scheme in your organisation. Senior members of your team also have the opportunity to reach our highest membership grade: fellowship. This is recognition of the success they've earned, and the experience they bring to your organisation. ICE works alongside employers to help develop and increase the range and number of apprenticeships on offer. ICE is also a registered End Point Assessment provider for employers and their apprentices. This can lead onto professional qualification as an EngTech or IEng. We have a global community of members and many have reached the top of their profession. This helps us collect, debate, exchange and publish the latest industry knowledge and ideas. This expertise is shared through our lectures, conferences, courses, publications and journals. It keeps members up to date with the latest commercial and technical developments, and keeps your organisation at the forefront of civil engineering innovation. We work hard to raise the profile of projects, the profession and civil engineers. Our successful 'This is Civil Engineering' campaign brings the work of civil engineers to the public’s attention. We produce banners and display them outside construction sites and offices to help people understand civil engineering and the role it plays in their everyday lives. Publicity campaigns like this highlight the work of your organisation and our members too. However, they can only be successful if employers from all sectors of the industry work together. We also run national and local awards to celebrate the outstanding achievements of civil engineers and their employers. These awards receive positive media coverage across the UK, often attracting publicity in local and national media, and in industry publications. Much of our work is done by dedicated and committed members who volunteer with us. They inspire the next generation of engineers, represent local views in ICE member groups, and sit on regional committees. This volunteer work also helps them develop new skills which can benefit their employers. We receive daily requests for engineers to visit schools to talk about careers and working in the profession. This benefits employers by increasing the number of potential future employees. By registering as ICE 'ambassadors', our volunteers receive training and resources to use with students. Working with young people is rewarding and great for CPD. It's also really important for the future of the industry. However it can only be done with your support. If you've got a question about how we can help you or your employees then we're here to help. Need to manage your Training Scheme? If your company currently has an ICE Approved Training Scheme, you can login to our employer extranet to manage the scheme.